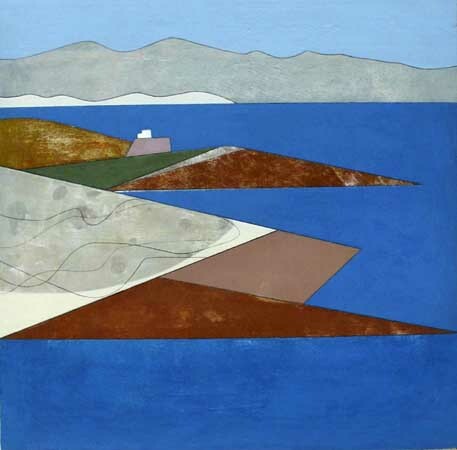 Artist Vanessa Gardiner is inspired by cliff and coast, the natural architecture of landscape. 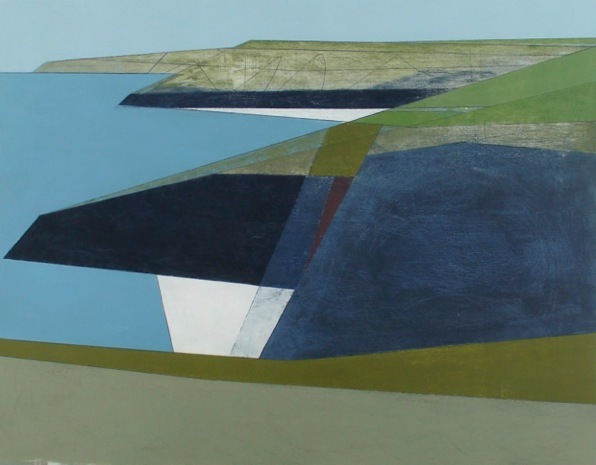 Since she left Central School of Art in 1982, she has been working at her theme, defining her voice through paintings that are clear clean abstracted landscapes, of Cornwall, the west of Ireland and Greece. Washed with sea light, scoured like pebbles to create texture, she works colours and shapes back to their essential form, cutting and reforming her boards until they are right. Vanessa Gardiner was born in 1960 in Oxford where her father was a tutor of philosophy at Magdalen College. She did her Foundation year at Oxford Polytechnic going on to study Fine Art at the Central School of Art and Design in London. 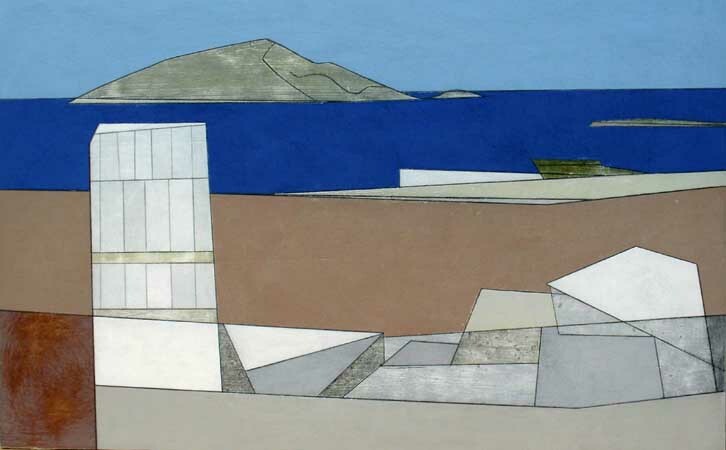 At first she had to work in offices to earn her living and paint in every spare moment but in 1991 she had her first solo show with Duncan Campbell Gallery in London and has been able to concentrate on her painting full time ever since. In 2001 she joined the Hart Gallery and has had six major solo shows there. In 2008 she had her first solo show at Sladers Yard which very nearly sold out. Her work is in private collections around the world and in public collections including Exeter Hospital, Bournemouth University Collection, Carlow Collection Ireland, the Archive of the Ballinglen Arts Foundation Co. Mayo, Cowley Manor, Huddersfield Art Gallery, Fidelity International, New Hall Cambridge, Magdalen College Oxford, British Academy London and the British School at Athens. She lives in Charmouth, Dorset, with the painter Alex Lowery and their daughter Jessie. 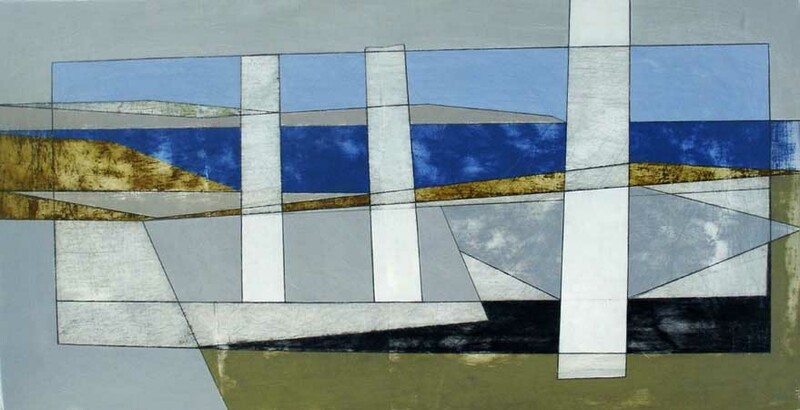 Vanessa Gardiner returned for her second major solo show at Sladers Yard with an exceptional and mature body of work inspired by Greece and the Aegean coast. In 2009 Vanessa was awarded the Prince of Wales Bursary for the Arts by the British School at Athens enabling her to embark on a series of trips to Greece. The purity and crispness of the light on the ancient rocky coastline has been the source for a rewarding and productive process of drawing and painting watercolour notes onsite, followed back in her studio in Dorset by the long slow period of painting. Vanessa’s technique of painting exposes her work to an equivalent of weathering. She applies layers of paint which she will then work back over time, scrubbing, sanding and scouring the hard surfaces of the board, scoring the lines that divide the areas of colour until she reaches exactly the textures and forms she wants. She works on a number of paintings at a time and they may take months to complete, time being an essential part of the process while the acrylic paint truly hardens. The longer she leaves the paint the finer and denser it becomes, allowing her to take it off very precisely. She does not impose on her work but approaches it in an exploratory way taking risks, based on experience, and then rubbing off the paint to find the elements as they develop. The places she has chosen to paint have different characteristics. The Peloponnese has a warmer-coloured, softer, wilder landscape where the sea is more turquoise than around the Cyclades and Sounion on the Attica coast. These are surrounded by light giving them a crystalline purity and sharp precision which speaks to the way she paints. 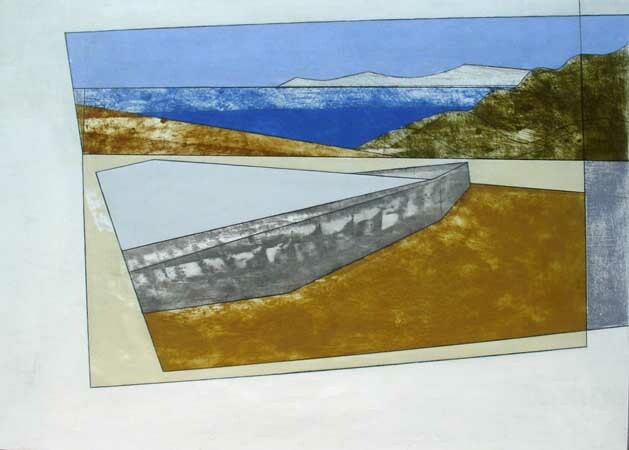 Gardiner works on a number of paintings at the same time, often using the same colours in different ways across more than one. Her ideas develop through the series as she slowly works them out over time with layers and layers of paint in her small powerhouse of a studio. When they are ready she will bring them to the time-battered walls of Sladers Yard and show them like newly exposed geology. Always interested in the natural architecture she found in Cornish cliffs and rocky edges, Greece has the added inspiration of weathered ruins of ancient classical architecture perfectly positioned within the rocky landscape. 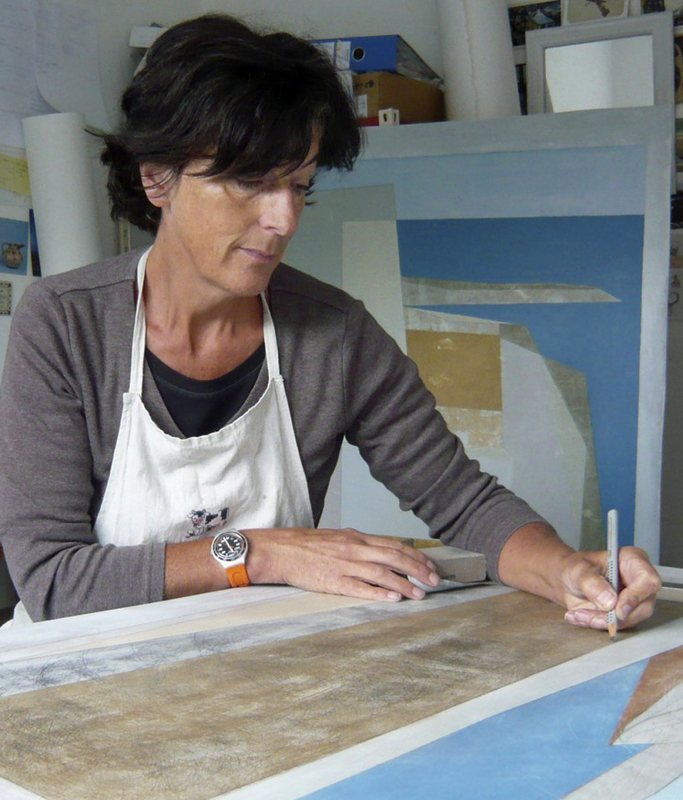 Vanessa Gardiner is able to evoke the fundamental natural beauty of the landscape through the physical fascination of texture and surface of paint. Her planes of colour and incised lines lead the eye through the rigorous clean clear and confident paintings of an artist firmly moving forward in the path of her work. Vanessa Gardiner will be giving a talk about her work at Sladers Yard on Friday 14 September, 8pm, Tickets: £8/£23 with supper. Phone 01308 459511. Love your work…just visited Discerning Eye in Mall and noticed the similarity of your work with Jeremy Gardiner- who won the £5000.00 prize….? His paintings seem to me very different to his print work- which I love too. Thank you very much for your comment and your praise for Vanessa Gardiner’s beautiful paintings. She has worked for many years to arrive at the strong clear clean way that she paints. Although they have the same surname and a similar technique of laying on layers of paint and working them back, I should point out that Jeremy is not in any way connected to Vanessa Gardiner.